4'3"?!? Amazing. I never would've guessed...they seem too heavy. They are definitely versatile horses! From their appearance you wouldn't assume so, but they really are surprisingly athletic. this is awesome! 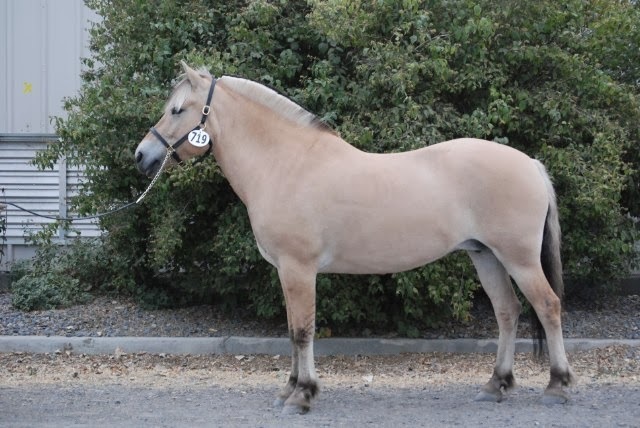 my coach wants to get a fjord to add to her herd and i told her about your blog and that you've got ypke. i know if they find out, they'll probably just go for it. they sound like good lesson ponies for kids to learn on while being versatile enough to work to do more like jumping and dressage. Like I said in the case against the Fjord, they do have a tendency to try to "manipulate" people to get their way. I know a common tactic that quite a few people (myself included) have experienced is fake spooking. If things aren't going the Fjord's way, they spook at nothing in hopes of intimidating the rider. There are others, and though they may sound ridiculous it actually happens. In that aspect, I'm not quite sure about being a lesson horse for kids, though I suppose if there is trainer supervision it would be fine. Their tendency to be levelheaded, bold, sound, and versatile are good lesson horse traits though. i saw a fjord warming up at a recent dressage show (i was just volunteering), and the thing was stunning. like, a whole audience at formed at the rail just quietly watching it warm up. very cool horses! Neat! They are definitely eye-catching.